Our PA have organised a talk on Internet Safety to be presented by Ms Cliona Sheehan of the National Parents’ Council on Monday, November 30st at 7:30pm in the Community Centre. The session will focus on strategies for improving communication between parents and children and negotiating boundaries to their internet usage. Parents will be introduced to strategies which will help their children be responsible, effective and safer internet users. 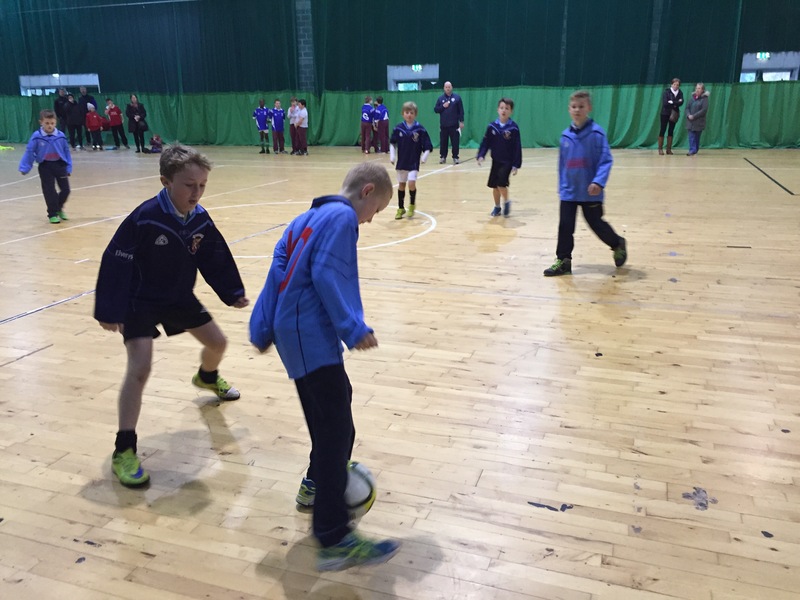 Our 3rd & 4th class boys had a great day out in Breaffy Sports Arena today at a local Futsal blitz. Futsal is a type of indoor soccer played with a small, heavy ball. Unlike indoor soccer, players are not allowed play the ball off the wall. There is an emphases on control and skill. 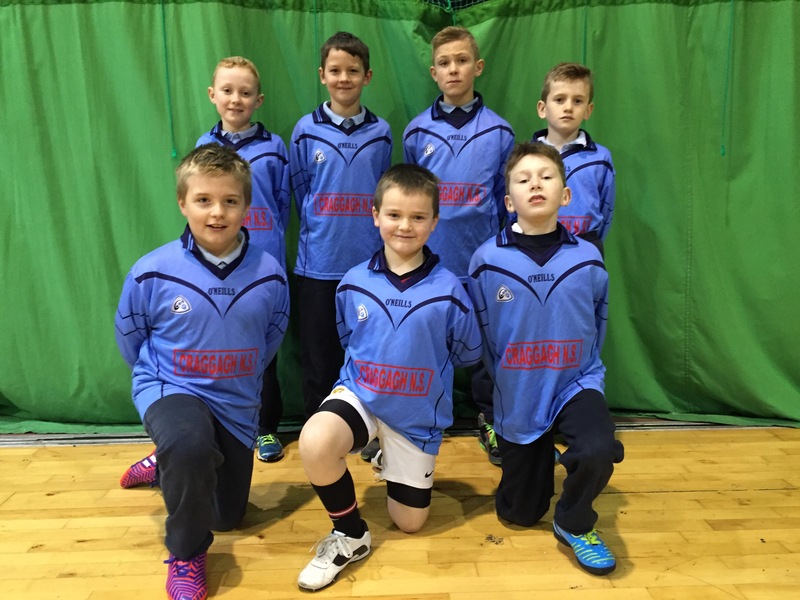 We had some tough games against St Pat’s, Breaffy and Snugboro but the boys aquitted themselves really well, scoring 4 goals in the process. 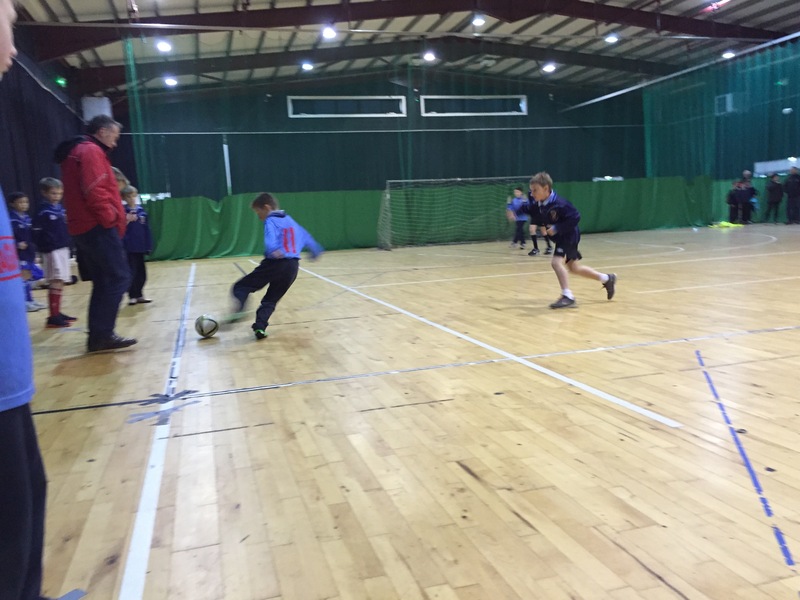 Thanks to Paul Byrne of FAI Schools for organising the event, we really enjoyed it! We’re studying all things 1916 in history these days as we lead up to next year’s centenary celebrations. 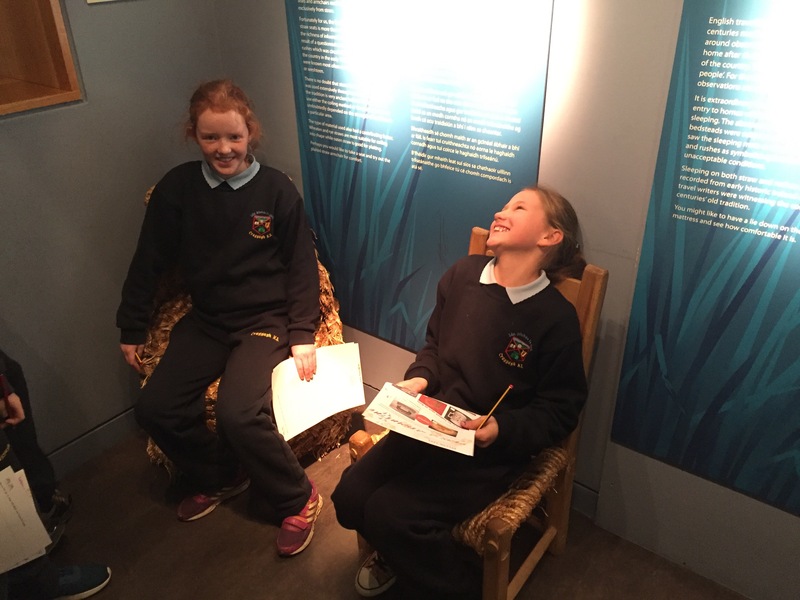 We are particularly interested in local stories about Craggagh, Kiltimagh & Balla and the lives of the people who lived here. 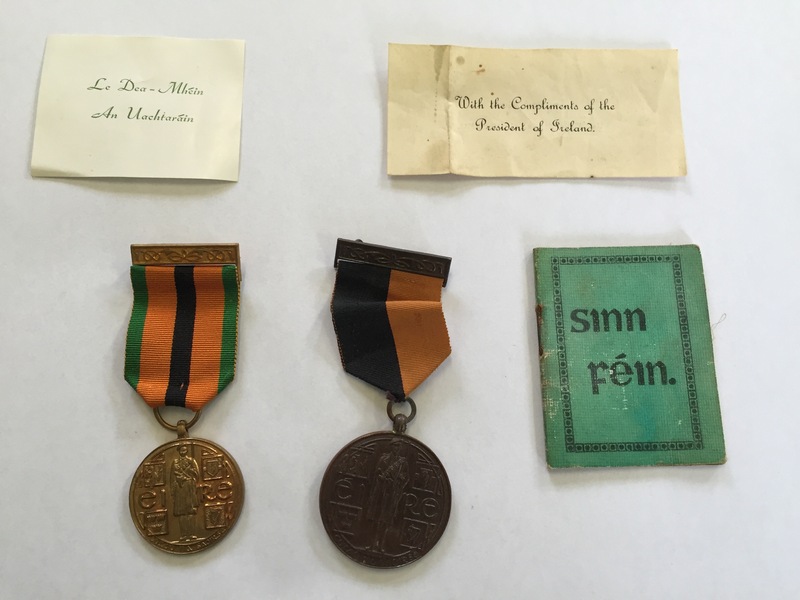 Today, Alannah brought in these medals which were awarded to her great grandfather, Martin McNicholas, Carnahan, Craggagh, for his activities during the period of the Irish War of Independence. You can read more about these medals on the Military Archives website. The medal on the left above (green, orange and black ribbon) is the Truce Commemoration Medal awarded to veterans still alive on June 11, 1971 which was the Jubilee of the 1921 truce. (a) Medal with bar to persons who are in possession of a military service certificate entitling them to a pension under the Military Service Pensions Acts in respect of active service in the period subsequent to 1916 and prior to 11 July 1921 and to those persons not in possession of a certificate who satisfy the Minister for Defence that had they applied for a pension, their service was such as would have merited the award of a pension. (b) Medal without bar to persons who were members of Óglaigh na hÉireann (Irish Republican Army), Fianna Éireann, Cumann na mBan or the Irish Citizen Army for the three months ending on 11 July 1921. 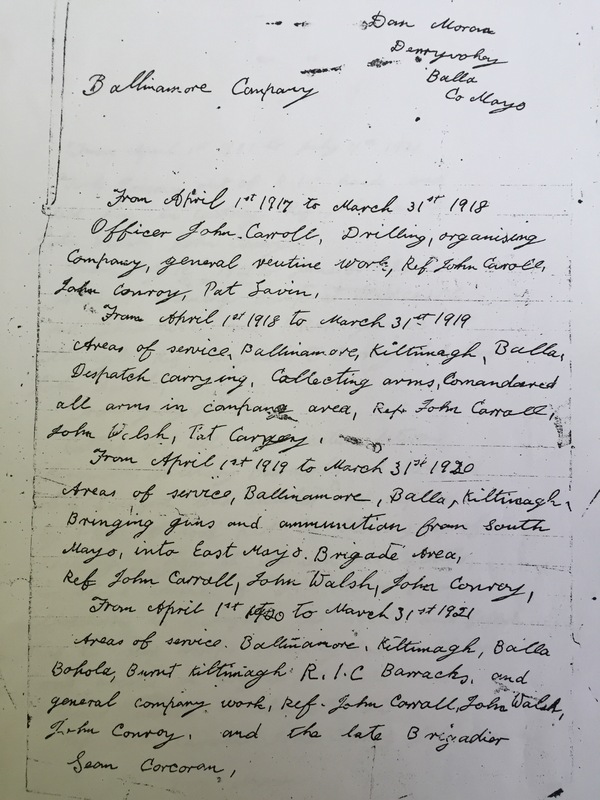 During the early 1970s when DeValera was president, he invited veterans to apply for these medals and pensions, by listing their activities and referencing their contemporaries as proof. Many thousands were awarded medals and pensions during this time. 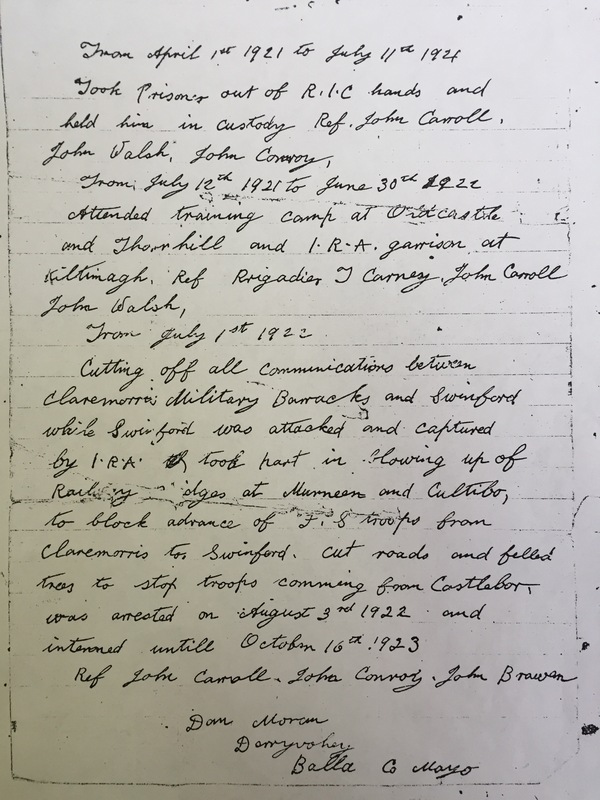 Below is the account of Dan Moran from Derryvohey, Craggagh (Mr Charlton’s grandfather) who was also awarded his medals in 1971. This was an amazing time in Irish history and our area is no exception. There’s loads to explore and we’ll publish what we find here. If you have anything relating to this period of history, especially if it relates to our locality, please get in touch. We love local history, especially if we can use primary sources. We’d love oral stories, written records, photographs, medals, membership books, oath cards etc. Thank you for your help and stay tuned! 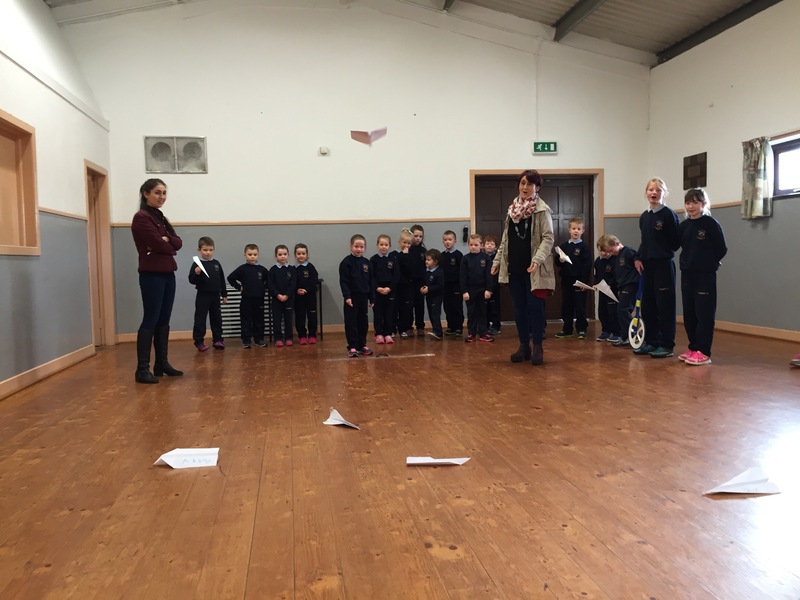 Paper Planes Competition – the results are in! #scienceweek Amazing work! We had some absolutely fantastic entries for our paper plane competition today. 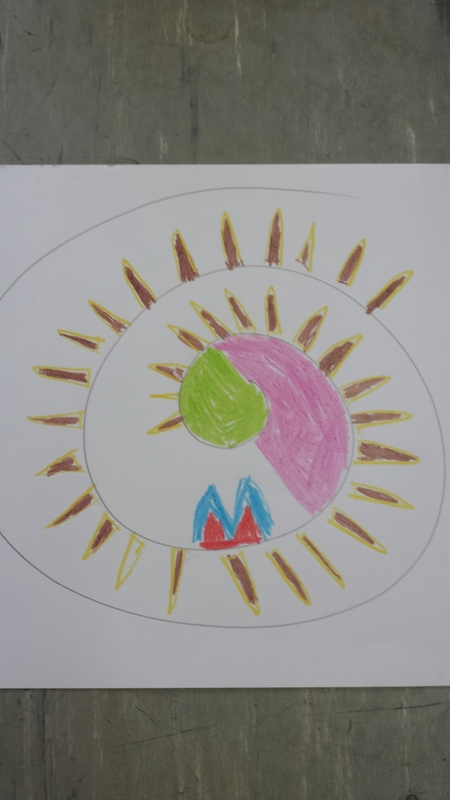 We saw a great range of designs from students right throughout the school. 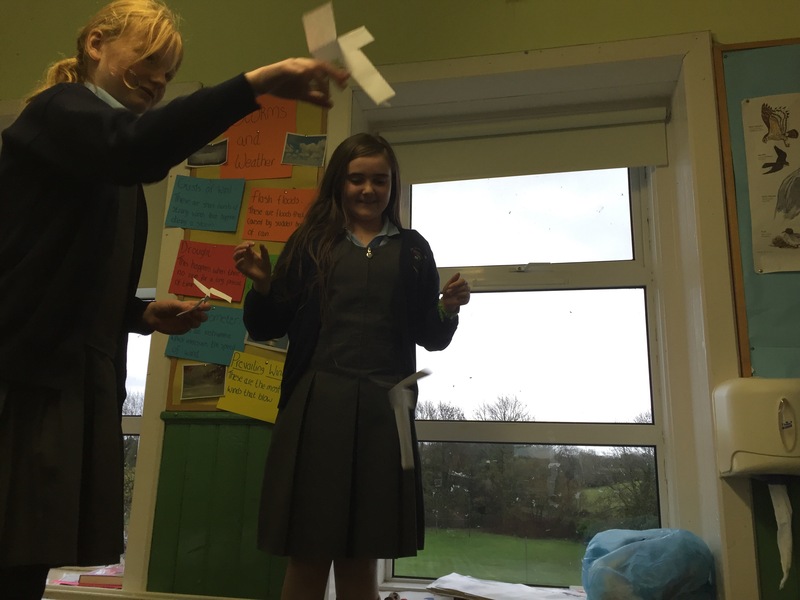 Our longest flight was recorded at 11m 30cm by Oisín in 4th class, making him the Senior Room winner. 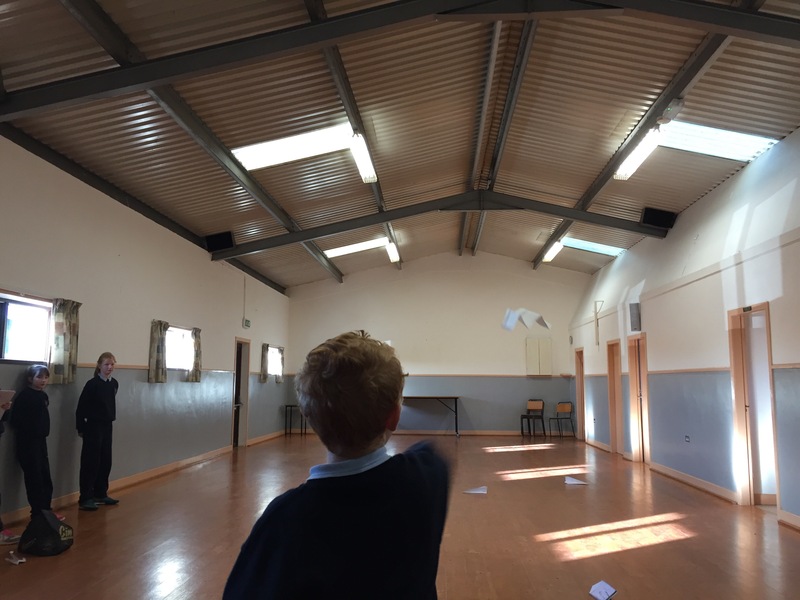 TJ recorded the longest flight in the middle room with 9m 58cm and Saoirse was the Junior Room winner with a very impressive 9m. 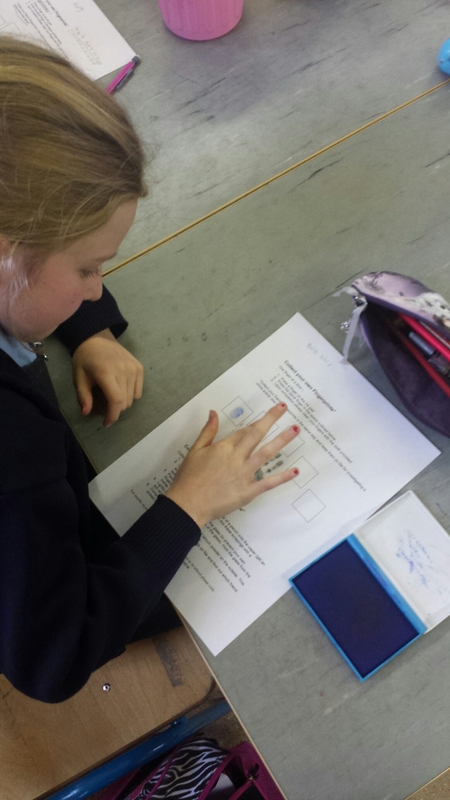 Saoirse in Senior Infants reached an incredible 9m! 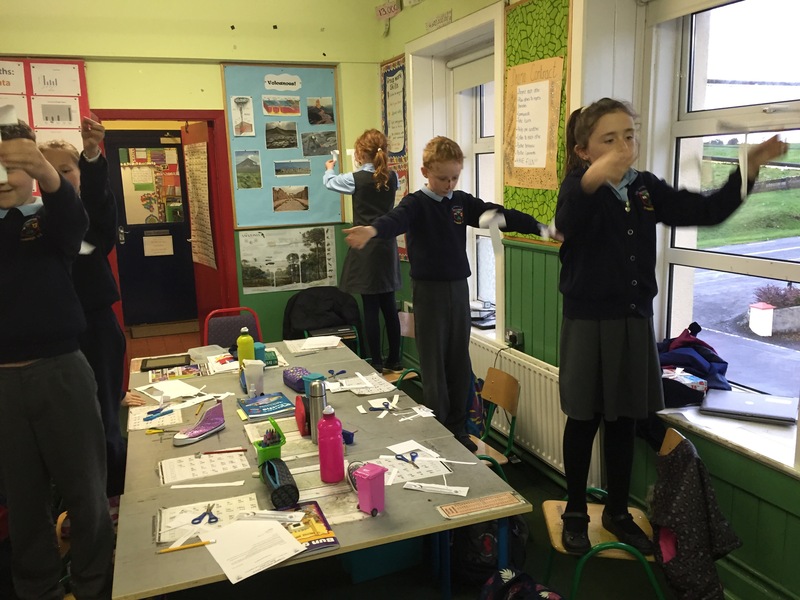 There was some brilliant learning throughout the week as children tested and tweaked their designs aiming for the longest flight time possible. We noticed today that some of the planes that flew furthest had small bodies with wide wings which were folded along the edge, with a very pointy tip. The people with this type of design didn’t have to throw their planes very hard as they glided very well (i.e. they had good lift). Oisín’s plane however, was very narrow all over, much like the supersonic Concord aeroplanes. 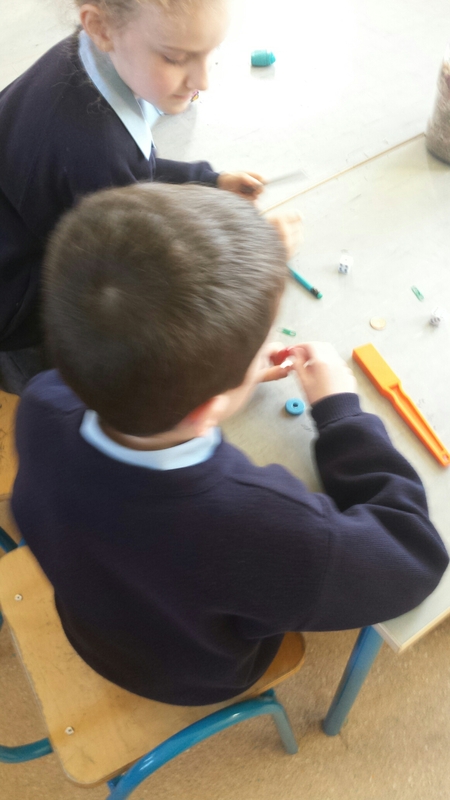 This allowed Oisín to fling his plane very hard (thrust) which is where he found his amazing distance. 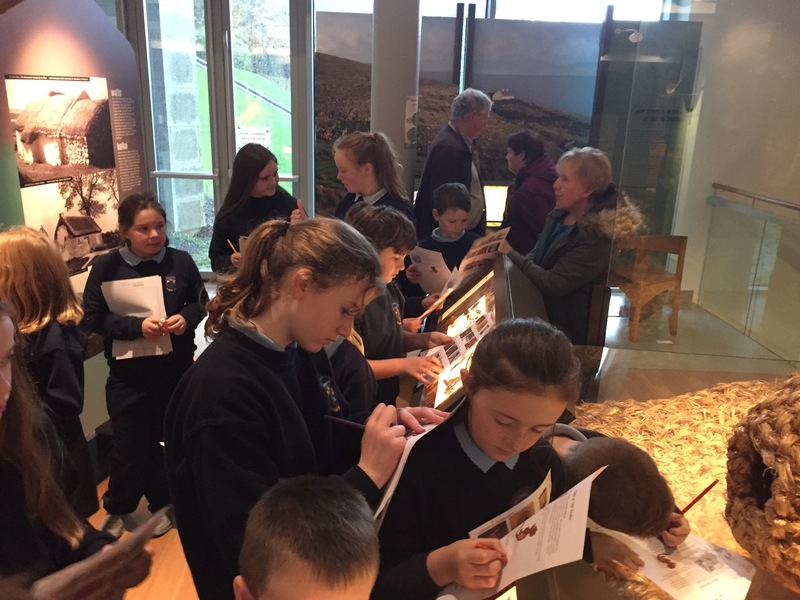 Congratulations to everybody who took part, what a great way to end #ScienceWeek2015! Today’s Science lesson was an investigation into how air moves when heated and cooled. 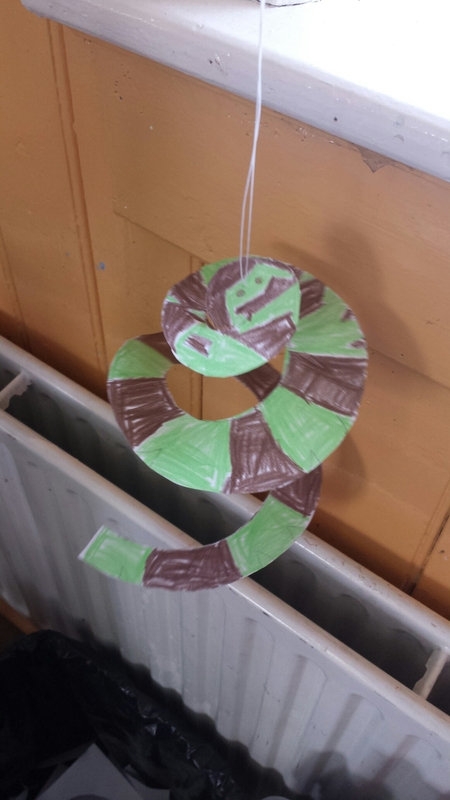 We started the lesson by making snake spirals. 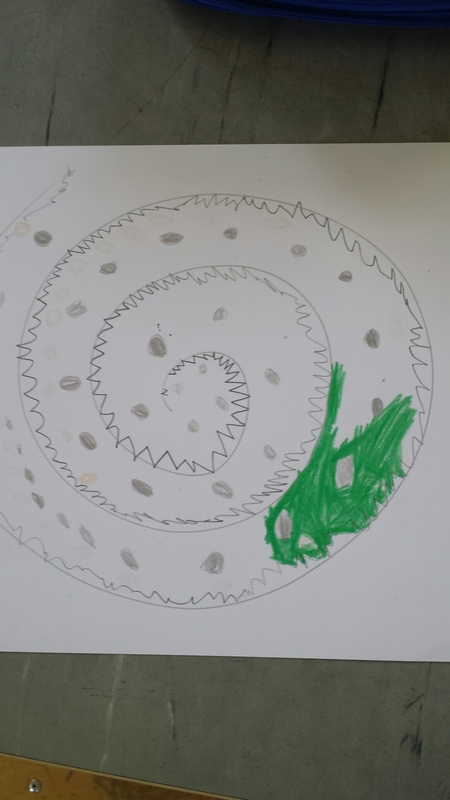 We drew a spiral and decorated it with snake patterns. We cut out the snakes and attached string. 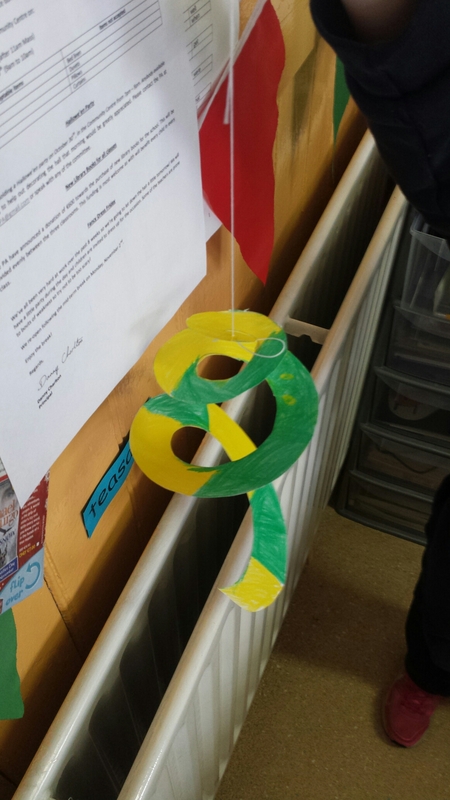 We discovered that when we held our snakes over the radiator, the snakes began to rotate. This was due to the hot air rising from the radiator. We did some research and learned that hot air is lighter than cold air. So hot air rises and cold air comes in to take its place. This causes air currents called convection currents. The air above the radiator is warm air which rises to make the snake swirl. Now we know why Mr Charlton’s and Miss Moore’s rooms upstairs are always warmer than ours! 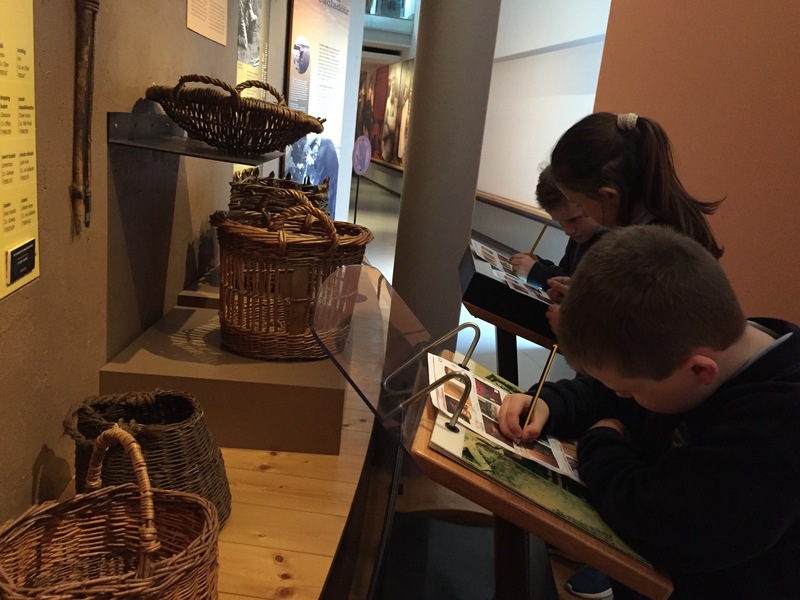 We had a fabulous day at the National Museum of Country life today. 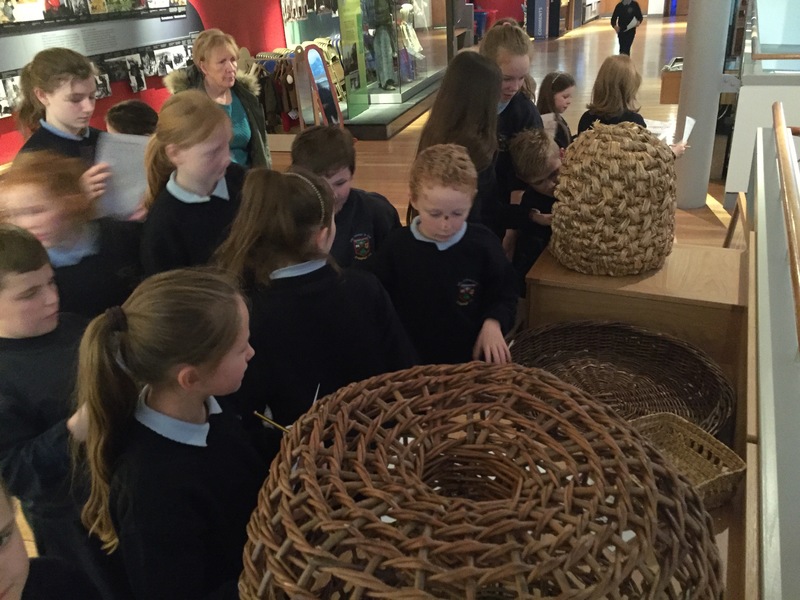 We spent most of our time learning about and examining ordinary objects made by people using the materials that they had to hand at the time; mostly straw, willow (sally) and heather. 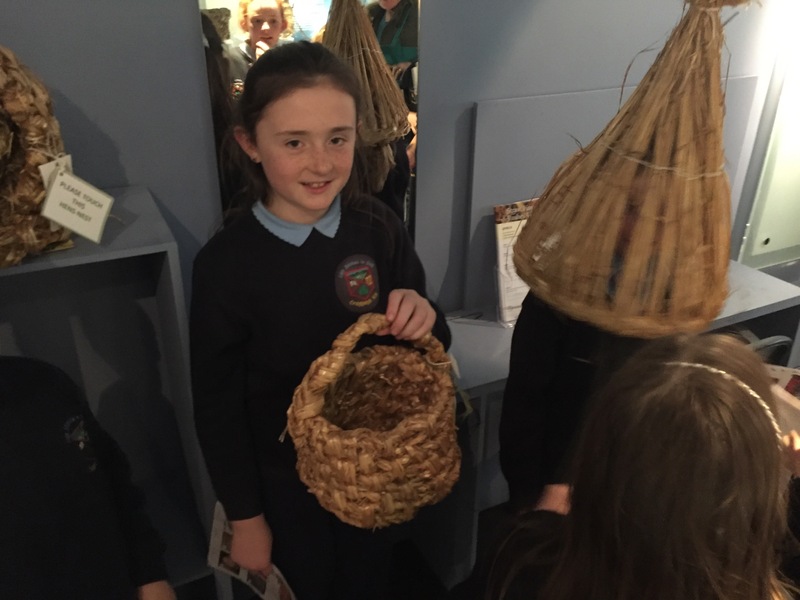 Straw basket…and guess who is that in the straw boy hat! 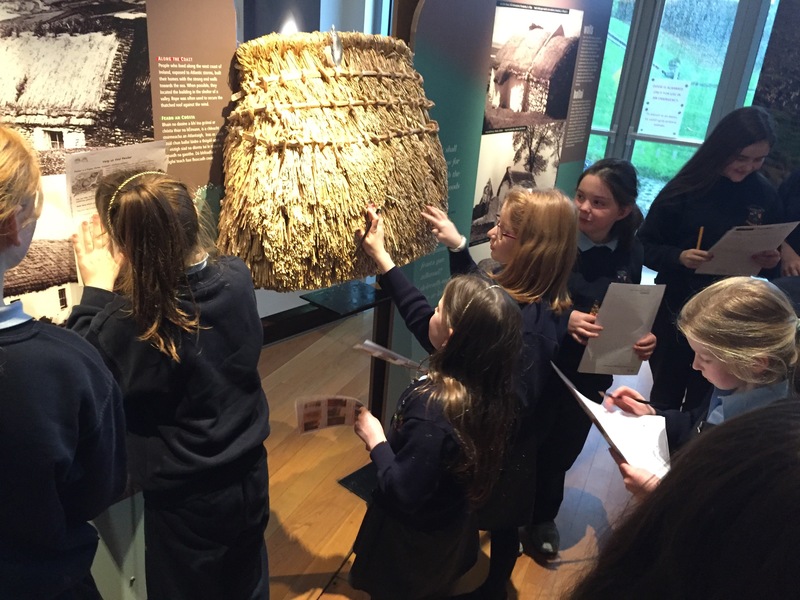 We got to look closely at thatching. We noticed when we looked at the 1901 & 1911 census records for our area in class recently that every house in our community was thatched except for one! Straw is naturally water resistant and is a fantastic natural insulator. 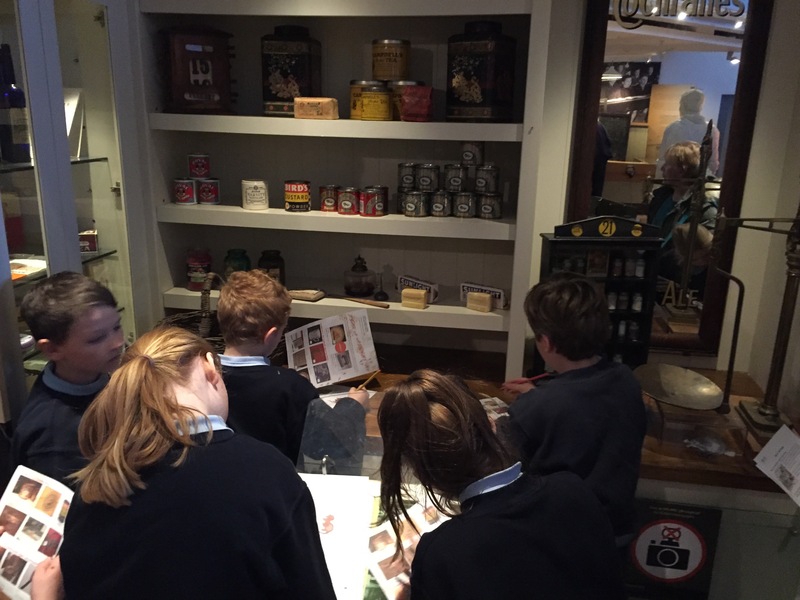 Finally, we briefly explored the sections “Hearth & Home”, “Trades”, “Farming & Fishing” and “Life in the Community”. 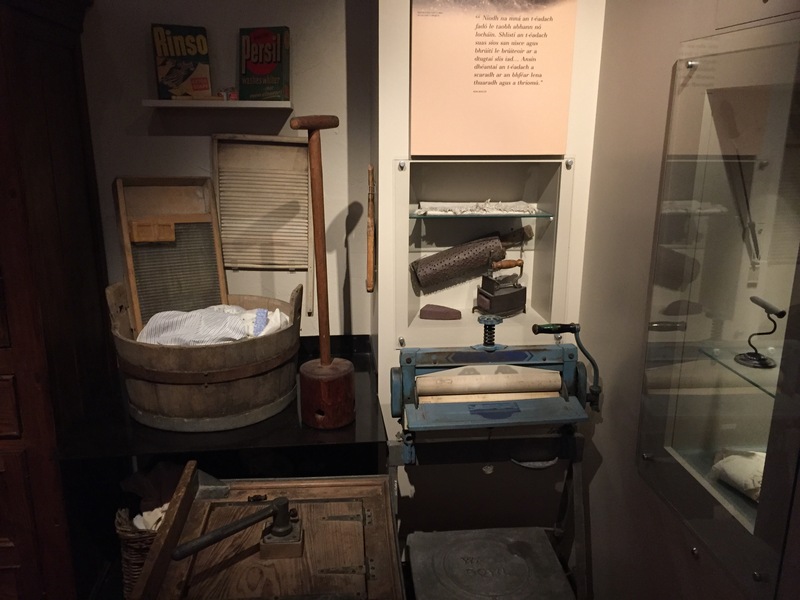 laundry was a little different long ago…but we still have Persil! 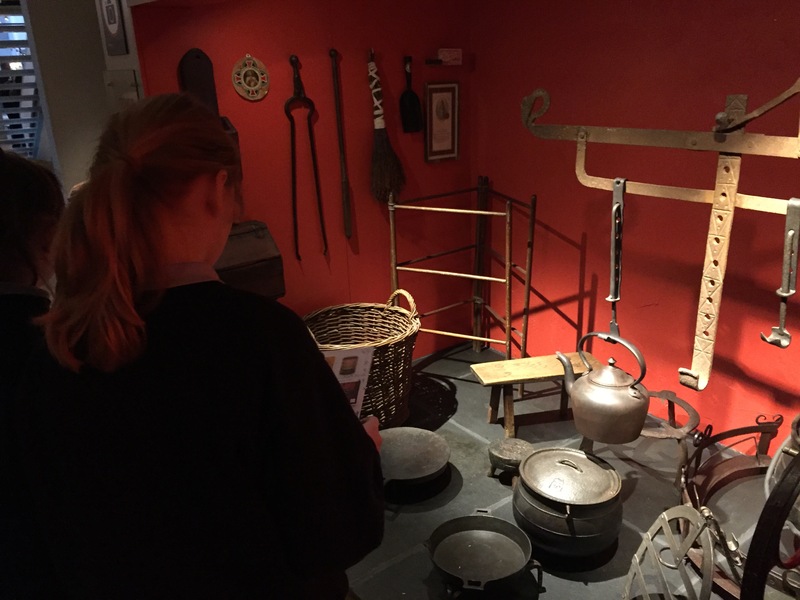 We found the school section particularly interesting. School life was very different from today. The objects used in school have changed a lot. 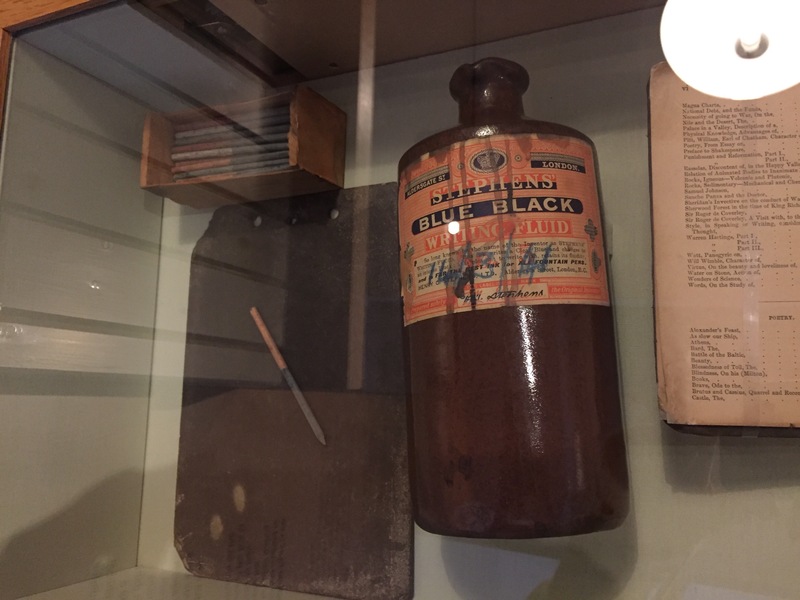 We don’t use ink wells, quills or slates and we don’t learn the catechism….and our teacher doesn’t use the strap! 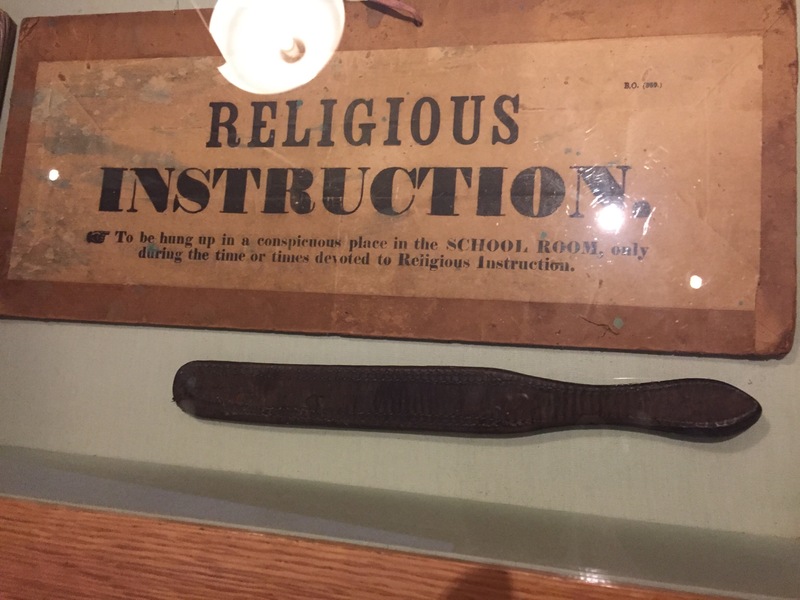 sign hung during religion class…and a leather strap. Does this thing have Twitter? 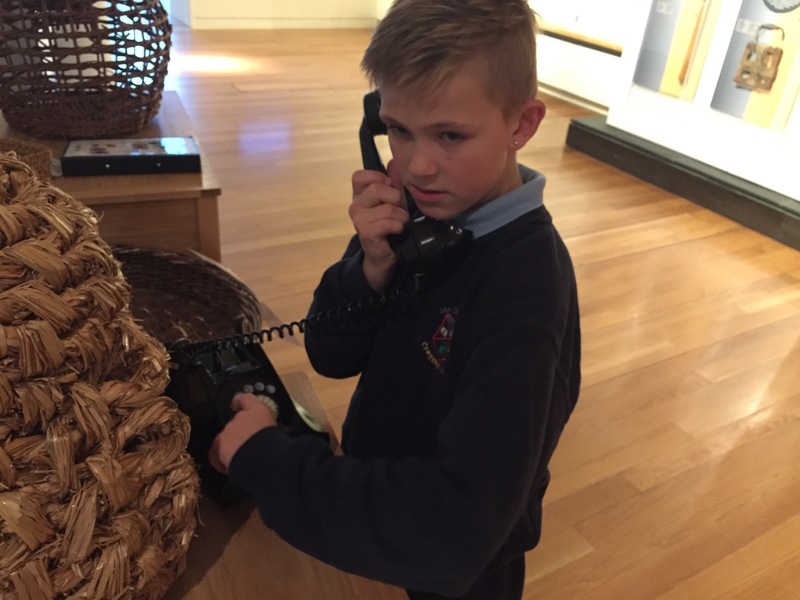 Being able to see and handle historical artefacts makes for very engaging and memorable history lessons. We’re very lucky to have such a wonderful facility so close to us. 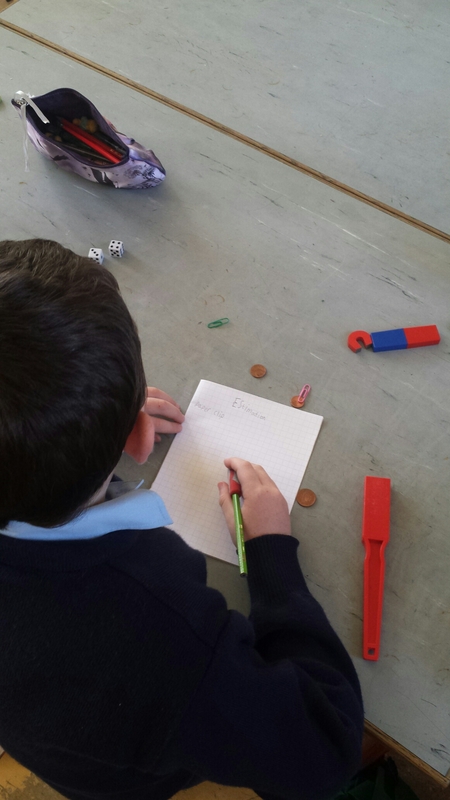 Day three of Science Week 2015 in Craggagh NS involved magnets and dancing paperclips! Today we tested the strength of magnets. We investigated how magnetic pull worked over varying distances. We used squared paper to help measure the distance of the magnet’s pull. 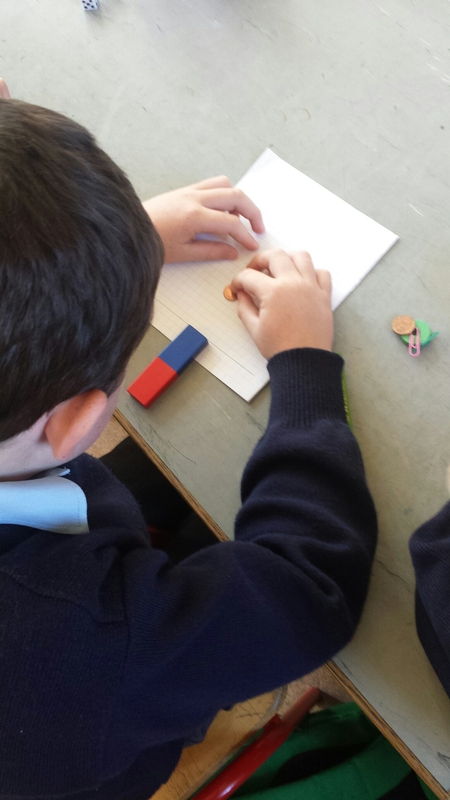 To make a fair test, each group used the same type of magnet and similar magentic objects. Our next step was to investigate the effect that a barrier had on the strength of the magnet. We discovered that a thin piece of plastic had very little effect on the magnet’s pull, so we introduced a more substantial barrier. 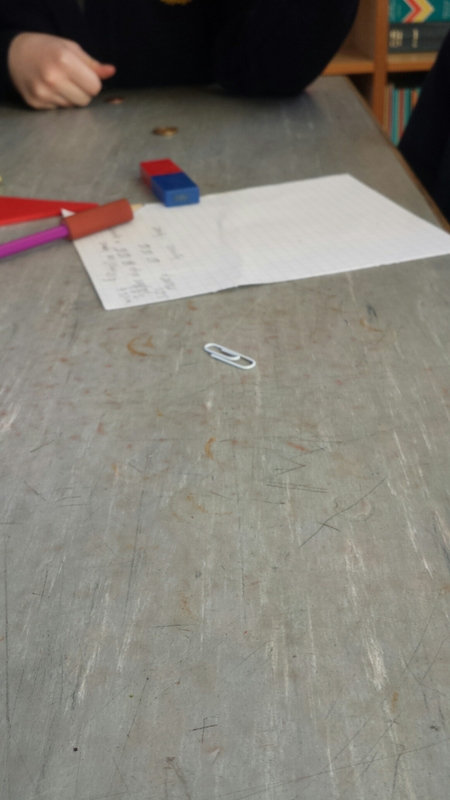 We placed paperclips on our desks and tested how the magnet worked from under the desk. 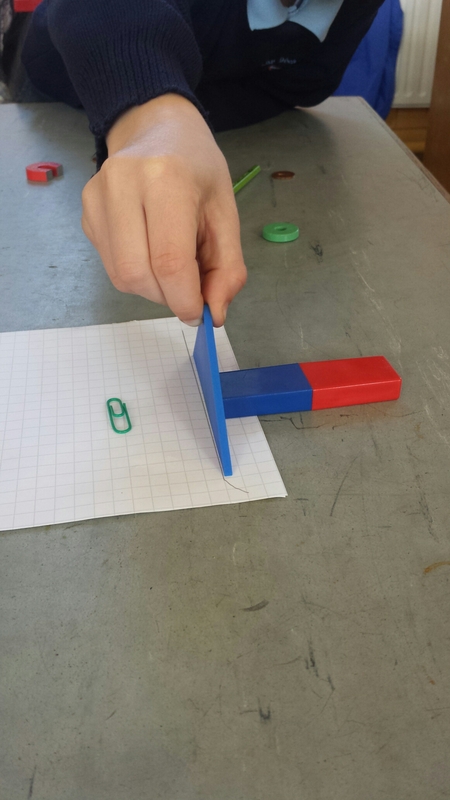 We found that while the magnet was not strong enough to move the paperclip very far, it did make the paperclip move from side to side. We thought it looked like the paperclip was dancing! 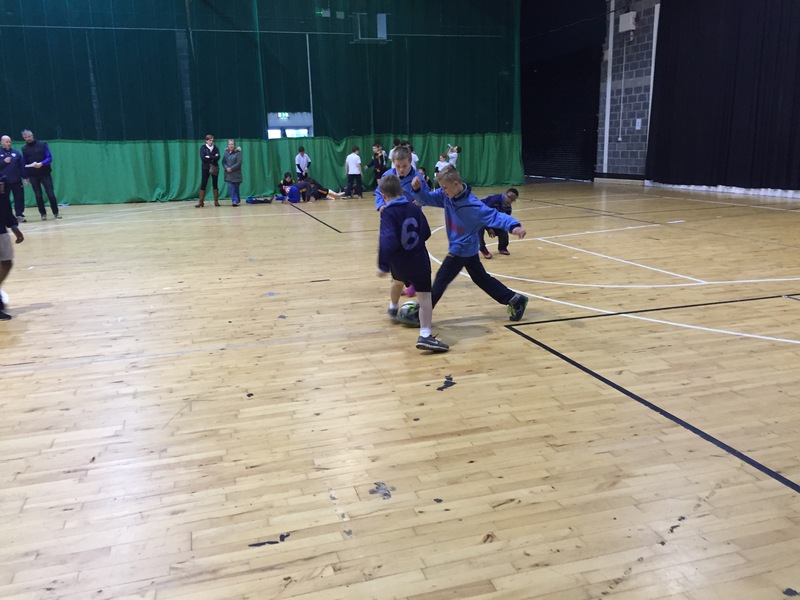 The boys of 3rd and 4th classes will participate in the local Futsal competition to be held in Breaffy House Sports Centre on November 24th. Our boys have been drawn in Group A which will see them pitted against Breaffy NS, St Pats NS (Castlebar) and Snugboro NS. The top team from this group will qualify for the County Finals. Futsal is the official FIFA version of indoor soccer and the only internationally recognised small sided game. The word “Futsal” comes from the Portuguese phrase “futebol de salao” or the Spanish, “futbol de sala” which basically translates to indoor football. The main feature of the game is the ball which is a size 4 and is slightly weighted with a reduced bounce. The ball and rules create an emphases on improvisation, creativity and technique as well as refining ball control, passing and dribbling in small spaces. 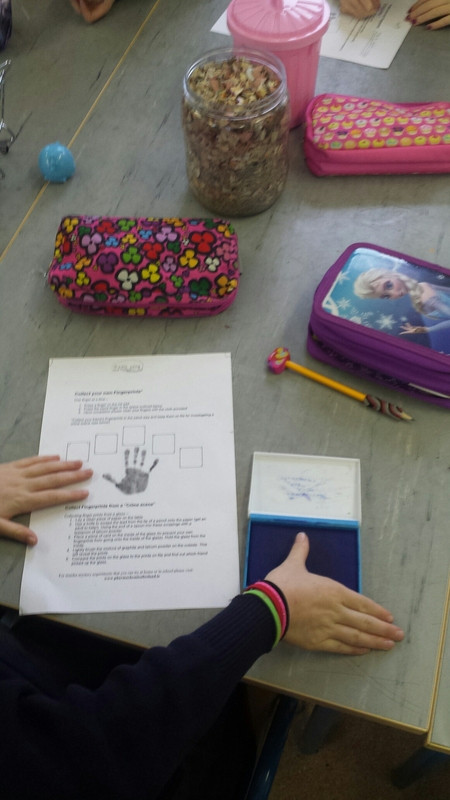 Today we were practicing the science of forensics in 1st, 2nd and 3rd. 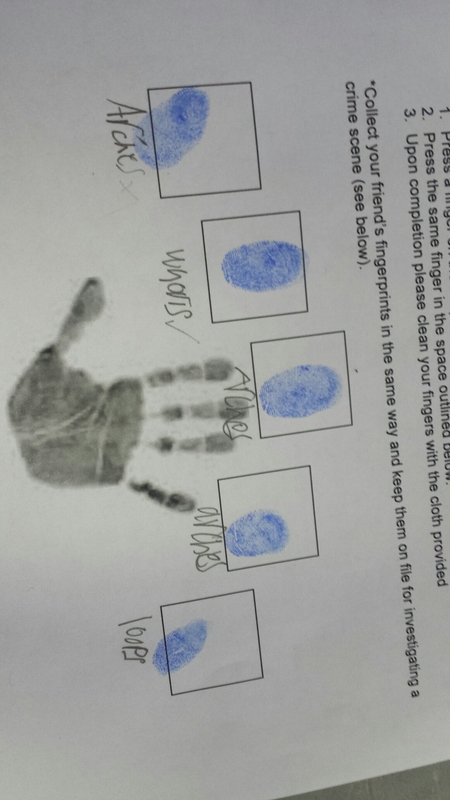 Fingerprint ananysis is probably the most well known form of forensic science. 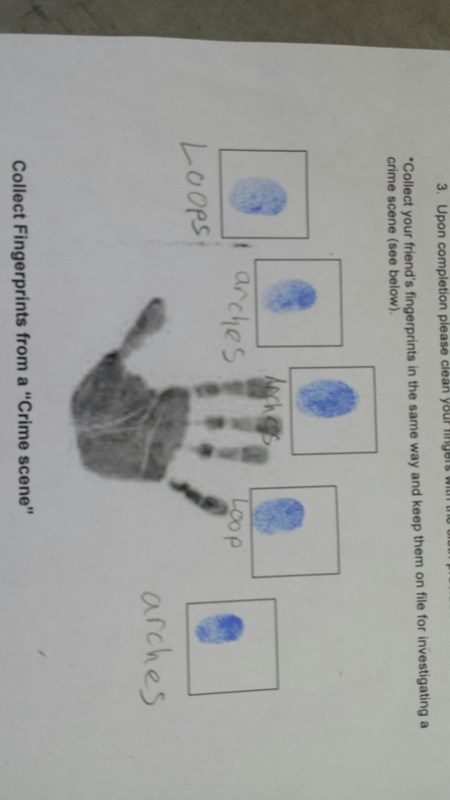 We studied our fingerprints in todays science lesson. 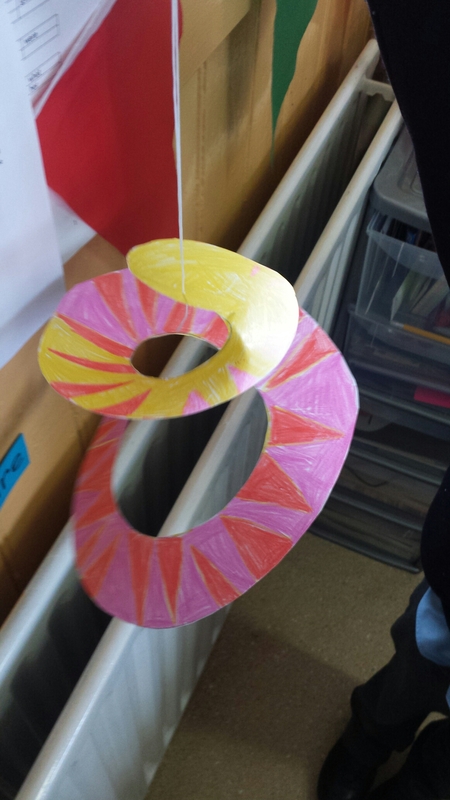 We discovered that there are three main types of print patterns; arches, whorls and loops. 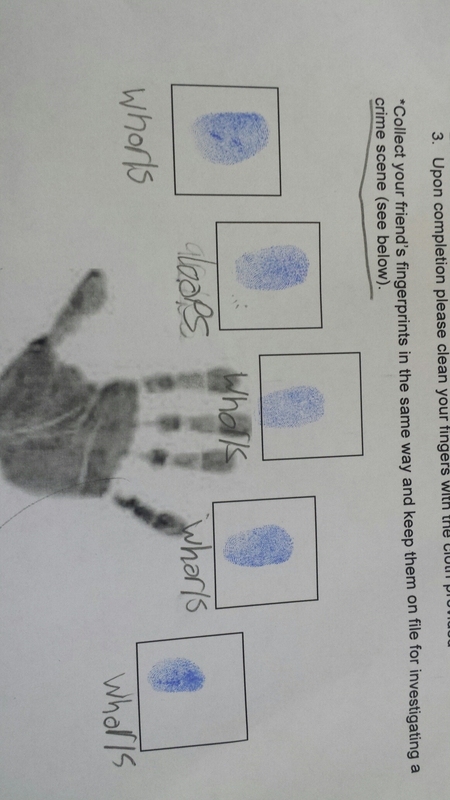 We took samples of our finger prints using an ink pad and some paper. 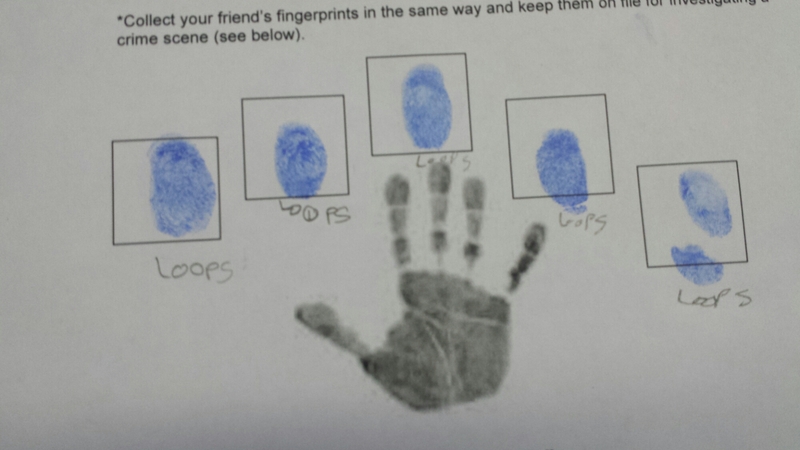 Once we had taken the fingerprints, we then had to analyse them to find out our print patterns. 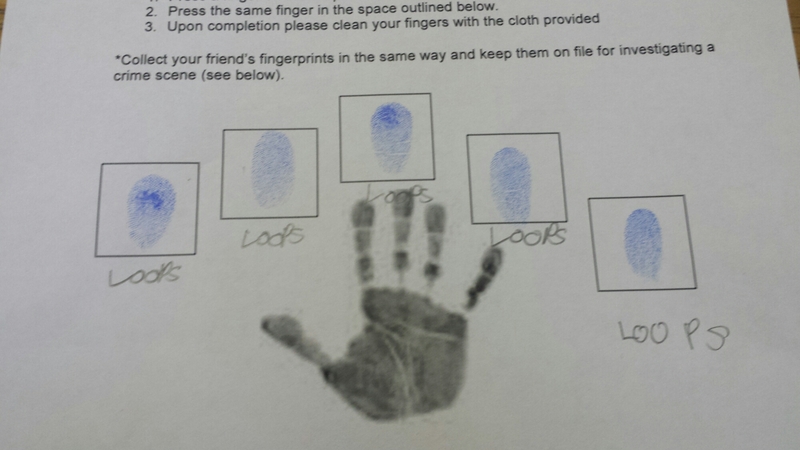 Beware criminals, we’ve got budding forensic scientists in Craggagh NS! The Sacrament of First Holy Communion will be celebrated in The Church Of The Holy Family, Kiltimagh on May 7th, 2016 at 12pm. No dates as yet for Remember Me Together Masses or Sacrament of Penance. 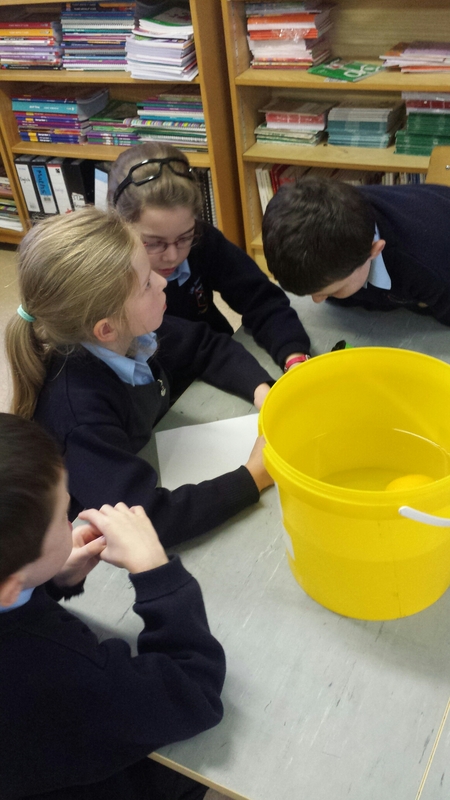 To kick of science week in the middle classroom, we investigated what makes objects sink or float. 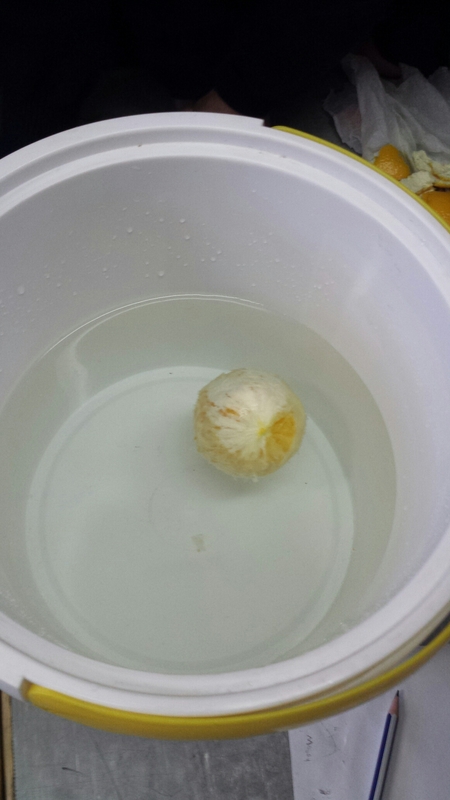 We discovered that an unpeeled orange floats in water. 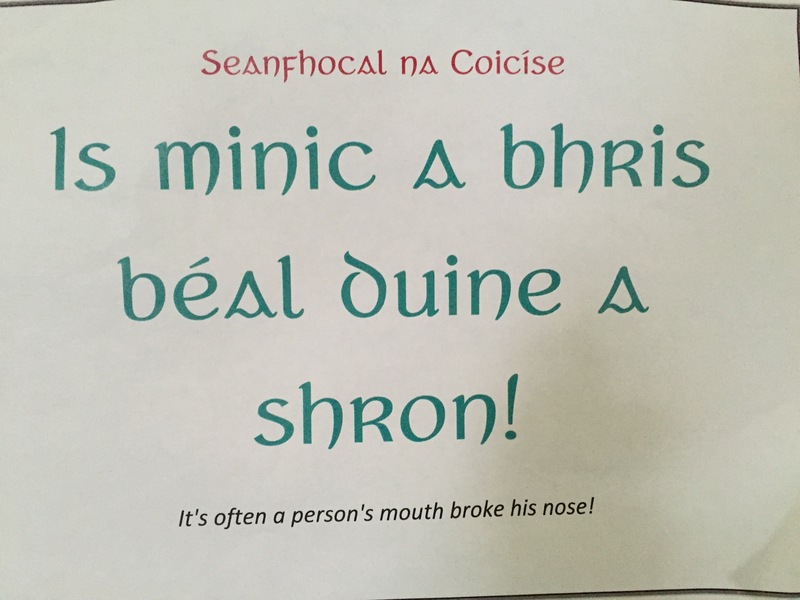 We thought that this was because there is air between the skin and the flesh. 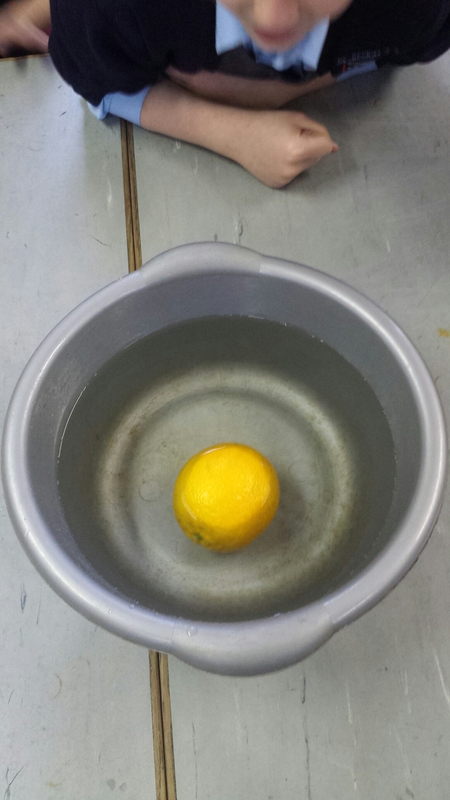 We decided to peel the orange to test our theory and see if it would still float. 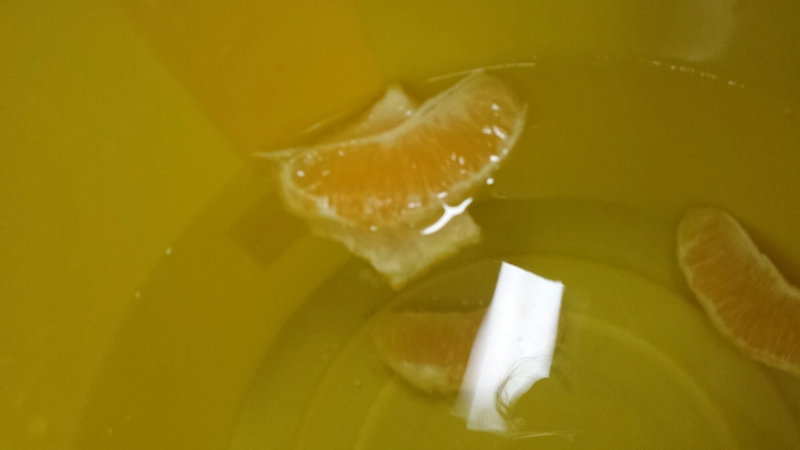 We found that the peeled orange sank, but not all the way to the bottom of the bucket. This meant that there was still some air trapped in the orange. To investigate where that air was trapped, we separated the orange into segments. We placed the segments into the bucket and found that most of them sank to the bottom. We concluded that there was air trapped in the middle of the orange, where the segments joined together. Our final task was to try to make the segments float. We used the orange peel like a raft for the orange segment. Our investigation proved that trapped air makes objects float. The orange peel pieces also floated. We thought that this was because they were light and didn’t allow water to pass through. We are really looking forward to the rest of Science Week. Stay tuned for more of our experiments during the week! 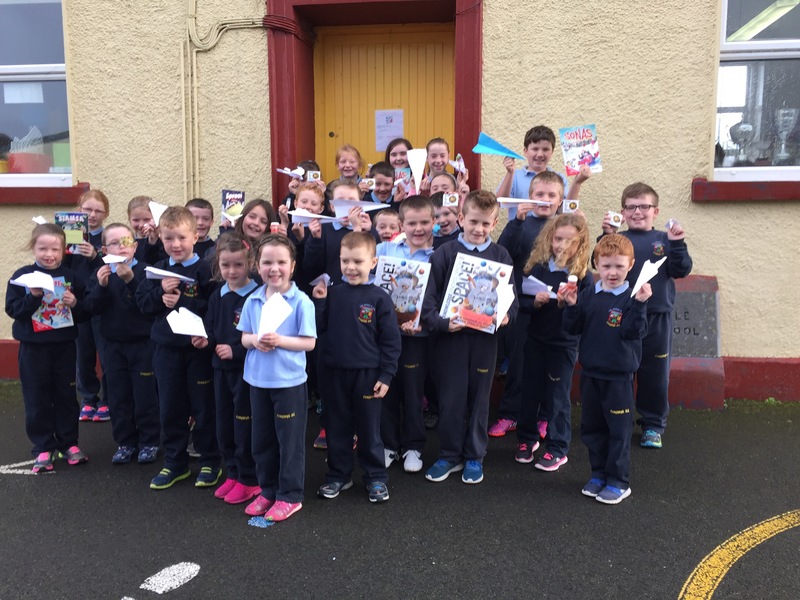 The competition is heating up in Craggagh ahead of our Plane Making Competition which will take place on Friday. We’ve discovered that our paper planes will need both thrust and lift to stay in the air. We will provide thrust by throwing our planes…that’s the easy part! The lift must come from our design. 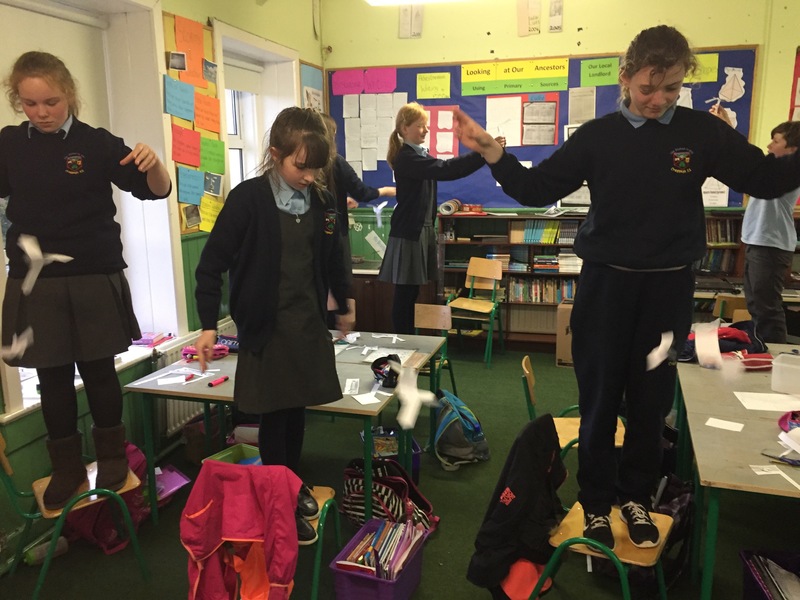 Today we explored gravity and air resistance by making paper helicopters. 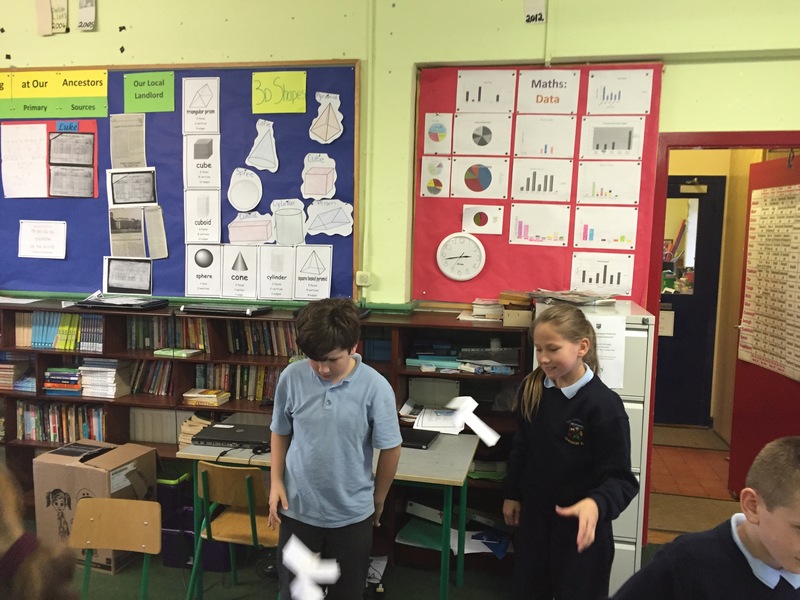 This will help us to understand the importance of the design of our paper planes. 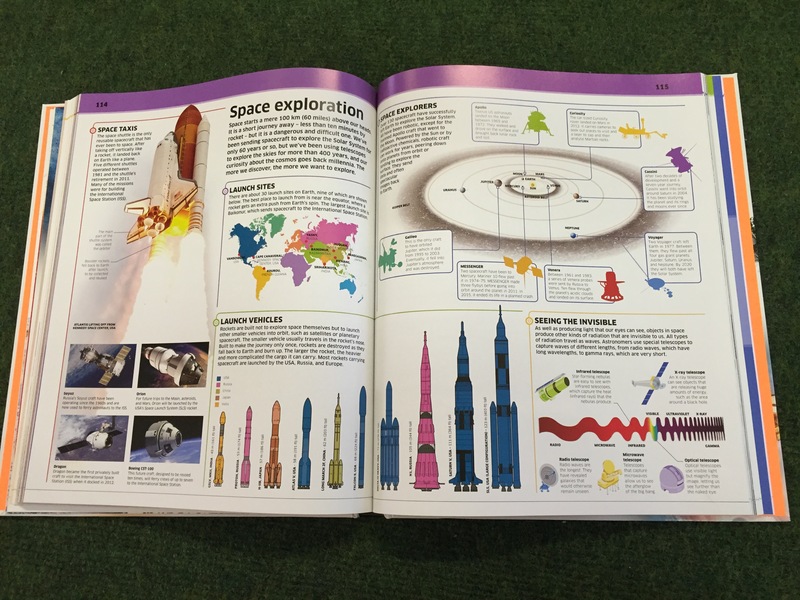 There’ll be prizes on offer on Friday, including a Folens’ Christmas Annual for the winner from each class and this fabulous DK Knowledge Encyclopaedia for the overall winners. Unfortunately, due to ongoing renovations in Breaffy Leisure Centre, swimming lessons have been postponed until after Christmas. We have rescheduled the lessons to begin on Friday, January 8th, running for six weeks as before. A letter is going home in school bags today to this effect. It’s time to get designing! There’ll be lots of science related activities throughout the school next week as we celebrate #ScienceWeek15 which runs from November 8th to 15th. Details below: Planes need two things to stay in the air, “thrust” and “lift”. You will provide the thrust when you throw your plane, and the lift is all down to your design! From NASA: How Do Planes Fly?